Preschool Pumpkin Theme Activities in Autumn! There are so many activities available to teach so many concepts with this theme! This page includes preschool lesson plans, activities and Interest Learning Center ideas for your Preschool Classroom! Let the Preschool Pumpkin Theme Activities Planning Begin! 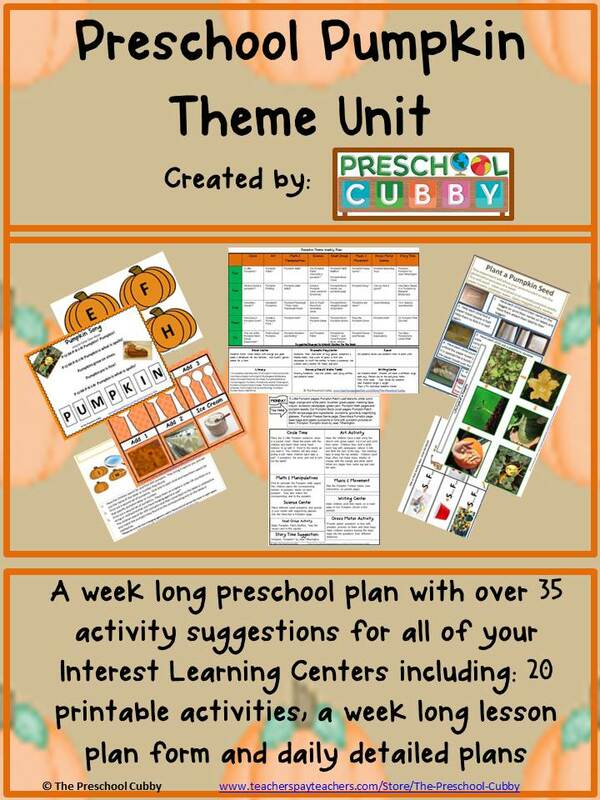 You can either scroll down through this page to see all of the preschool activities for your Preschool Pumpkin Theme Activities or click the link below to go to specific preschool activity types you are looking for. Materials Needed: white lunch-sized paper bags, orange and white paint, brushes, masking tape, green paper, leaf stencil, crayon, scissor, newspaper, LOTS of green yarn! 1. Have children trace a leaf onto green paper using the stencil, cut it out and then print their name on the leaf. Set aside. 3. Help them to twist the top of the bag. Continue twisting to make it look like a stem on the top. Use masking tape to keep the top twisted. 4. The children paint their bags. Let them experiment with the orange and white paint to make different shades of orange on their bag pumpkins. 5. When dry, staple the child's leaf with their name on it to the stem of their pumpkin. 6. Connect all of the pumpkins together by using the green yarn and display the pumpkin patch on your wall or bulletin board! Materials Needed: Brown construction paper, orange and green paint. The children make a fist shape with their hand. Dip their knuckles into the orange paint and then print knuckles onto paper (it makes a pumpkin). The children use their thumb to make a thumbprint on top of their pumpkin (it makes the leaf). Materials: Small Gourds, paint and paper. Cut gourds in half. Use the stems to hold while dipping in paint and use to make gourd prints on paper. Cover some of your blocks with orange paper, wrapping paper, plastic wrap, etc. to make some fun textured constructions! Provide farm items and small pumpkins or gourds for the children to recreate a pumpkin patch. 5 Little pumpkins sitting on a gate (hold up 5 fingers). The 4th one said "Let's run and run and run." (Hold up 4 fingers. Then place fingers on floor and have them move as if they are running). 5 little pumpkins rolled out of sight. (Make a rolling motion with your hands). Snack Recipe Ideas to Cook Up for Your Preschool Pumpkin Theme! 1. Talk to the kids about pie--do they like it? What's their favorite? Ask about pumpkin pie! Tell them about all the things made with pumpkin (cookies, bread, butter, soup, etc.). Tell them they are going to make their own ice cream! 2. Give each child their cup. Have them write their name on it(or you can pre-label the cups). 3. Each child should add once scoop of ice cream. 5. Have them add 1 spoonful of pumpkin and stir that in (if they refuse to want to use it, you can use orange food coloring!) Enjoy! And of course, a Preschool Pumpkin Activities Theme would NOT be complete without mentioning that you could simply cook pumpkin and check out the smell and texture and then use it to make your favorite pumpkin pie recipe with the kids! Provide a large doll and many articles of clothing for the children to make their own scarecrow together. Include things like hats, overalls, boots, etc. As mentioned before, use props and items that are common for your area and weather during your Preschool Pumpkin Activities Theme! Add pumpkin leaves or vines to use to paint with instead of brushes. Decorate a trash can or laundry basket as a pumpkin. Use bean bags to toss into the "pumpkin". Pumpkin Hunt Thank you, Nagwan, for this idea! Cut as many as you want paper orange pumpkins shapes, 1-15 or 1-20, depending on your age group. Hide them all over the classroom and let the children go for pumpkin hunt. When they bring it to you they have to tell you what number is on the pumpkin. Have fun and you can do that with any shape you want it goes with so many themes. Pumpkin Pumpkin by Jeanne Titherington (Make pumpkin felt pieces to go with this story for circle time or story time). Preschool Pumpkin Theme Ideas To Help Your Preschoolers Develop Their Math Skills and the Small Muscles In Their Hands! Materials: Dried pumpkin seeds (possibly from the Pumpkin Discovery activity below in the Science section! ), Laminated programmed pumpkin shapes (see instructions below). In advance, cut out matching pumpkin shapes (as shown in the picture). Add a leaf to each one. Program them with the numbers or one-to-one level you are working on. In preschool, you may be working on number recognition or on one-to-one correspondence. I'd recomend programming your pumpkins to accomodate both areas so that you can use them from year to year with whichever level each years' students are at. On the front, print the numerals on the leaves and keep the pumpkin blank. On the back, again print the numberal on the leaf. In addition, draw that number of pumpkin seeds on the pumpkin. Provide these pumpkin cards and a small bowl of pumpkin seeds. This can be placed out as a self directed center where the children decide how to use the cards and seeds. It can also be used in small group or one on one teaching groups with the children where you can guide the children to use their fine motor, counting and one-to-one correspondence skills as needed. 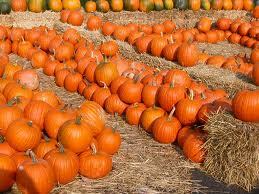 Provide many sizes of pumpkins and gourds for the children to sort and classify by shape, size, color, height, etc. Preschool Pumpkin Theme Music and Movement Activities and Ideas to get your Preschoolers Movin' and Groovin'! P-U-M-P-K-I-N Song Thank you Cheryl W. for this song! This son is sung to the tune of "Camp-town Races"
Camp-town Races sing this song, Oh the doo-dah day! Camp-town Races sing this song, Oh the doo-dah day. Okay, now you're ready! Let's sing the Pumpkin Song! P-U-M-P-K-I-N, pumpkin's what it spells. P-U-M-P-K-I-N pumpkin's what it spells. Sitting in a circle, play some music and have the children pass a small pumpkin to the person next to them. Keep going in a circle and when the music stops, they stop passing. They then name one thing about the pumpkin to describe it. Preschool Pumpkin Theme Ideas For Your Sand and Water Table! Provide different pumpkin items to see if they sink or float! Include small pumpkins, gourds, pumpkins seeds, pumpkin leaves, etc. Materials: Small pumpkin for each child, 1 length of yarn for each child (the length should be 4 inches longer than their pumpkin), weight scale, My Pumpkin pages (described below), pumpkin carving knives, spoons to scoop out seeds, 2 pieces of orange construction paper, a ruler, glue, markers and your camera! Page 1: My pumpkin looks like this. Page 2: My pumpkin is this wide. Page 3: My pumpkin is this __________________ inches tall. Page 4: My pumpkin weighs ______________________ pounds. Page 5: The inside of my pumpkin looks like this. 1. Take a picture of each child holding their pumpkin. 2. Have each child draw a picture of their pumpkin on Page 1. Add the picture you took of them holding their pumpkin to this page. 3. Give each child a length of yarn. Show them how to wrap it around the pumpkin. Take a picture of each child doing this. Help them to cut it to reflect how wide the pumpkin is. The child then glues their length of yarn to Page 2 of their book along with the picture you took of them. 4. Have each child measure the height of their pumpkin with a ruler. Take a picture of each child doing this. Help them to write how many inches tall their pumpkin is on Page 3 of their book. Add the picture that you took to this page. 5. Have each child place their pumpkin (one at a time) on the scale. Take a picture of each child doing this. Help them to write how many pounds their pumpkin weighs on Page 4 of their book. Add the picture that you took to this page. 6. Help each child cut open their pumpkin (of course, take a picture of this!) and scoop it out! Help them to separate the seeds from the goop and save the seeds. Have each child draw a picture of what the inside of their pumpkin looks like and glue a few seeds (once they are dry) on Page 5, along with the picture that you took. 7. Use the orange paper as a cover and back page for your book. We named ours "__________'s Pumpkin Journal" and put the date and a picture of all the pumpkins they cut open! These books are a great keepsake for later years for your children and their families! Use this experiment to show what the pointy stem of the pumpkin used to do! At your science table, place a pumpkin and also a plastic cup with water. You'll need a talk of celery and blue food coloring. Explain to the children that celery is a stem that we eat and we do not eat the stem of a pumpkin. But, the job of a stem is to feed a plant! Place the celery in a clear up. Fill half way with water. Drop many drops of blue food coloring in and mix. Observe the changes over several days with the children. Make the connection that the pumpkin stem used to be connected to a stalk in the pumpkin patch and it used to help feed the pumpkin! Let the children feel the celery stalk and the pumpkin stem. Compare differences and similarities. Materials: Orange construction paper, crayons; scissors. Encourage the children to draw 2 eyes, a nose and a smile on the pumpkin. Have children use them to have a Pumpkin Parade after reading the book "The Pumpkin Parade" by Eve Bunting. Provide paper and drawing utensils for the children to use. The children print their names on the back of their paper for name printing practice. The children draw pumpkins with faces or an entire pumpkin patch! Be sure to write down their stories!